We witnessed a spectacular pink show which smelt of girly things and lots of candies & lollipops! With a colour palette of corals, bright pinks, blacks, off-whites & greys all together checkered and hand-woven Merino yarns stitched together & the Portuguese lace & trims, tartans, stripes, colour pop up, the 3D laser cut flowers, ribbon embroideries, beadwork, crochet detailing, the Péro Fall Winter Spring Collection at Amazon India Fashion Week Autumn Winter’18 was a delight to watch! 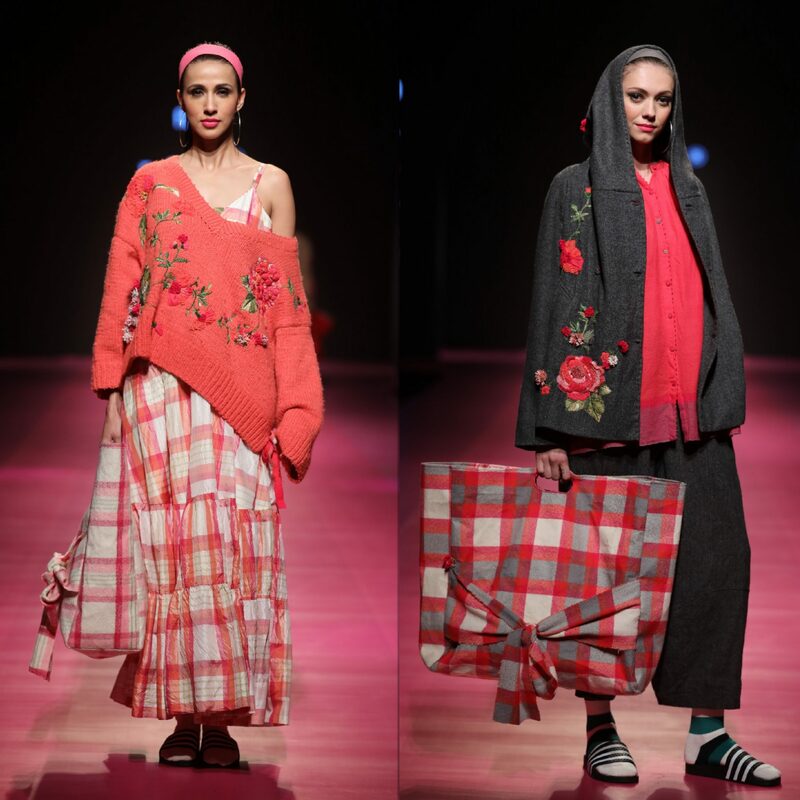 The feel was vibrant and so was the mood & colours which were intense with Scottish tartans revisited with re-sized, oversized & undersized blockings with inherent traditional twists, weaves & grains giving a vintage feel, love & charm to the entire show. 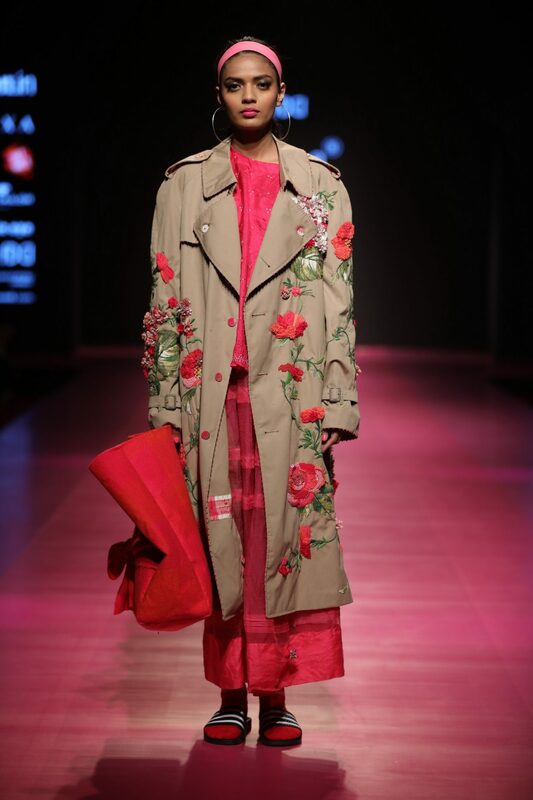 This season péro breaks the rules with a fresh take on the winter palette choosing pink & coral as the key colours. Turning snowflakes into snow flowers, she has taken inspiration from a faraway land making gloomy boring winters exciting & intense taking off from the black & white monochromes to colourful & bright winters i.e. pink winters! The ‘passamanaria’ (Portuguese for lace or trim) along taratans & stripes like 3D flowers, ribbon, beadwork & crochet detailing to the limited edition pieces formed inspirational & lovely exciting patterns. 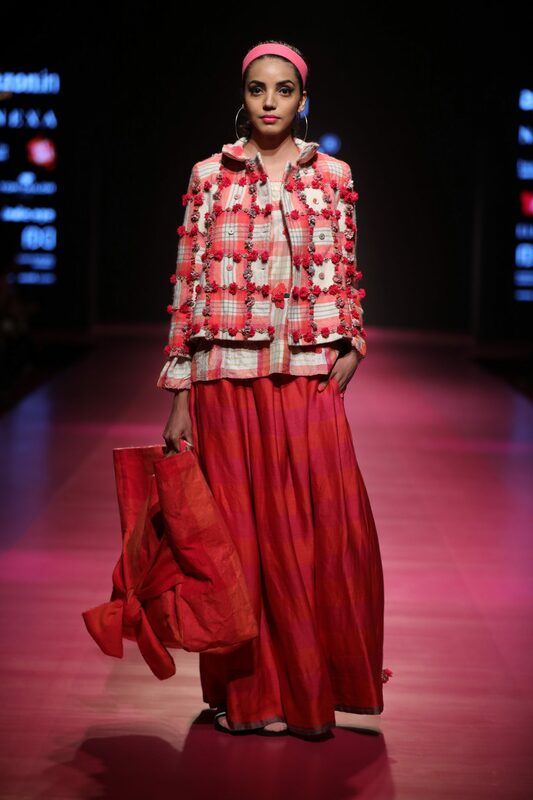 The tartans have been handwoven by local weavers residing in the hills of Himachal Pradesh. 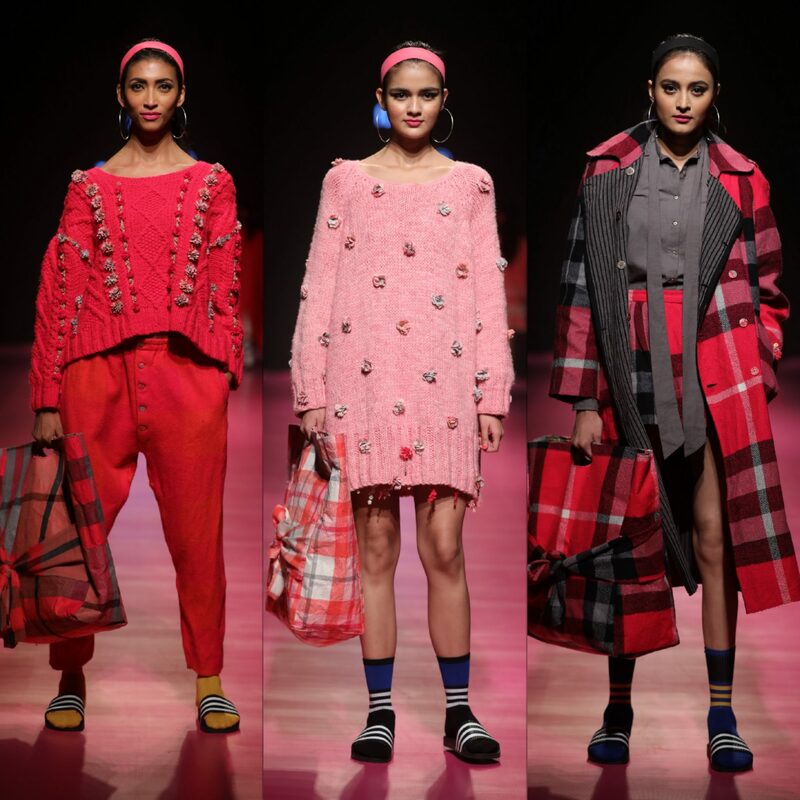 With a fresh take of the winter spring, the fun & frolic proliferated with Live candy making bar and a piano bar with polyrhythmic phonetic pattern of voices out of chopsticks, screws, bolts and metallic items at the show. Péro collaborated with the skill-full candy makers of Papabubble who use 100% handmade process to make sugar candies with lots of love. 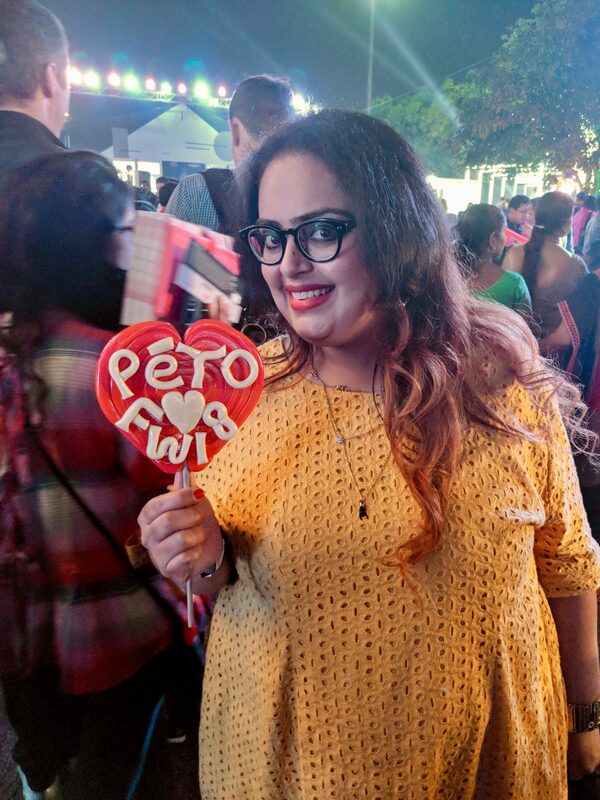 I even got a big heart shaped lollipop with Péro written which looked so colourful & lovely and was delicious too. The show combined together colours, clothes, confectionary and music tapped our senses and made a visual & virtual treat for us. Can’t miss the Papabubble candies & lollies in our Press Kit to take us home with as a remembrance of the fun we had!